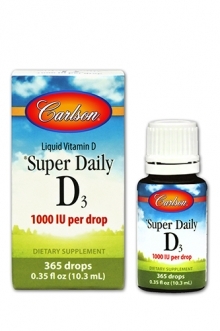 A 365-day supply of natural vitamin D drops - 1000 IU per drop. A good solution for young children who aren't getting enough vitamin D from sunlight and who can't swallow tablets. No carriers are used. Each drop contains 1000 IUs of pure vitamin D-3. I've recently moved from California to a much colder, more drearier climate. I believe these Vitamin D drops (and a light lamp) really helped me stay positive and alert throughout the dark winter months. I like the taste, too. I have been taking the Carlson drops for several months now. I work a graveyard shift and when the weather allows I try to get some sunshine in the morning when I get off work. That's not always possible. I take the drops for the ease of use. Sometimes with taking different herbs and supplements I tire of taking pills. I stay healthy and recommend this product.